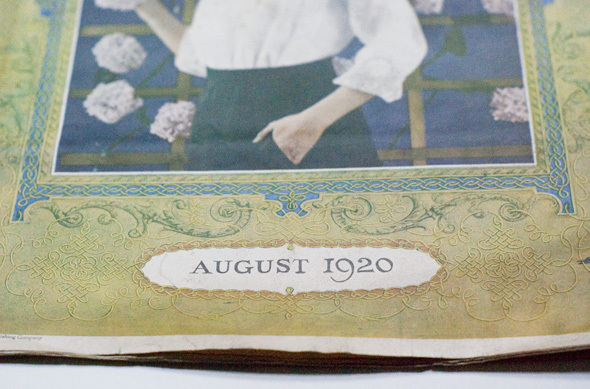 I have one last vintage sewing magazine to share with you, before I get on to the really really good stuff. 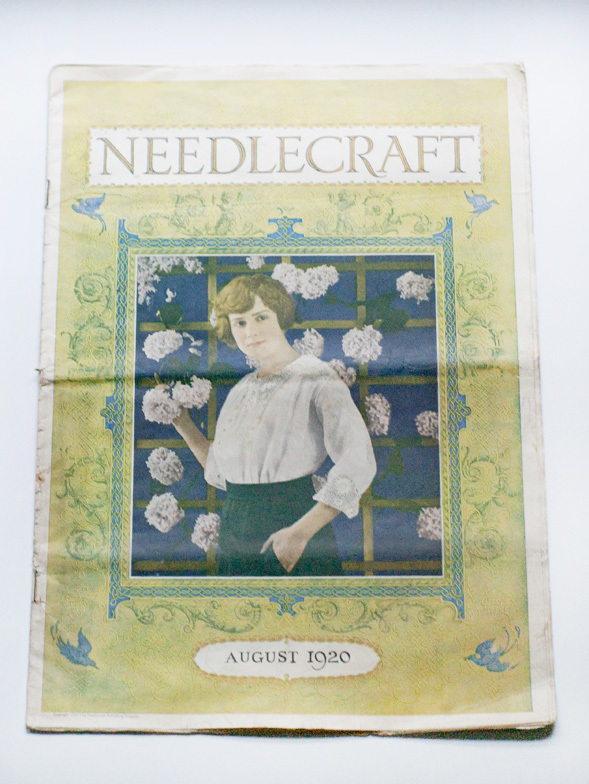 It’s an August 1920 NeedleCraft magazine, with a sweet golden green cover. This cover is my favorite one because of the colors and the intricate crochet work on the model’s blouse. By the way- blouse? I hate that word. Anytime I hear it I immediately picture it being paired with heavily pleated “slacks” (ACK! 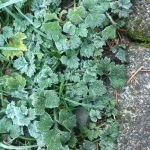 Another terrible word!). Good thing that those are nowhere to be found in this magazine! A tutorial for making the model’s shirt (nope, I can’t type that word again) is inside. 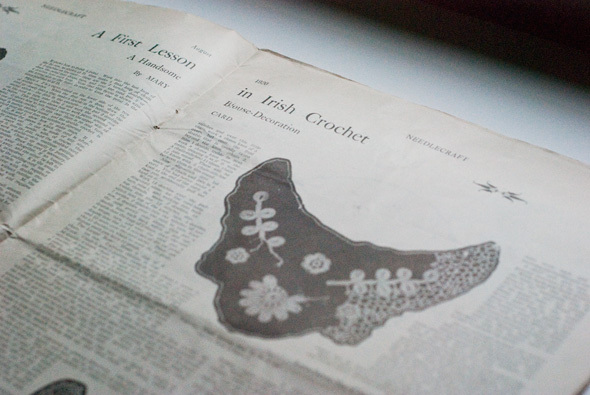 It uses Irish crochet and gives the entire history and a very in-depth lesson on making the lace pieces. 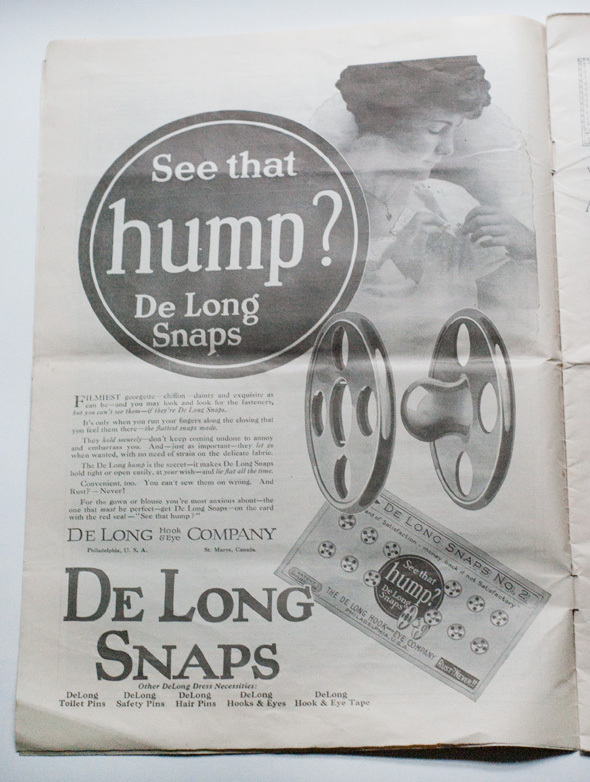 I would like to get my hands on some of these snaps. I wonder if the fact that female end has no front or back affected its ability to stay closed. And the word “hump”? Yeah, I sang a few lines of that Fergie song too. 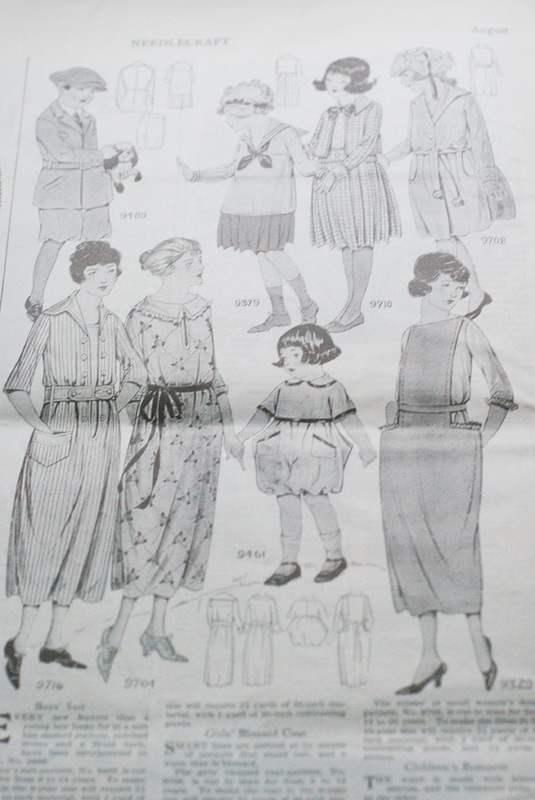 The fashions are most definitely different from even two years earlier. 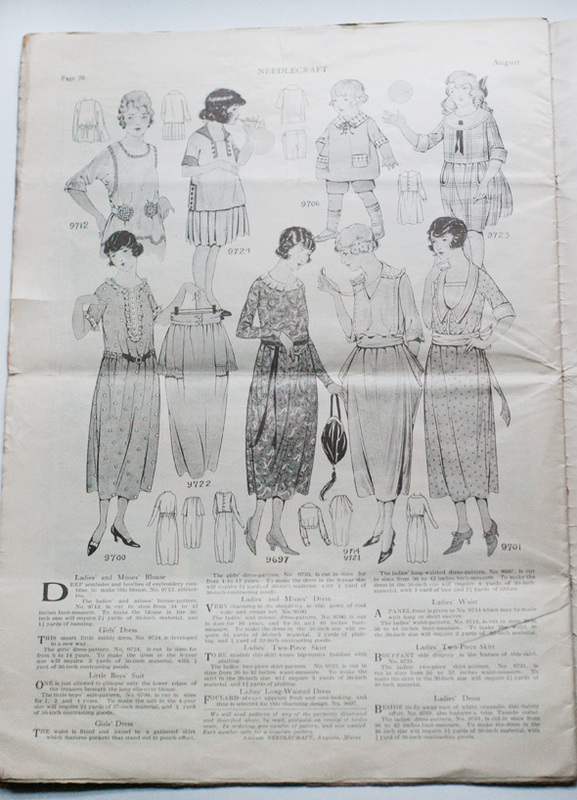 I like the wide dropped neckline on the housedress in the bottom right. I’m sure you’re eyeing the peg-top skirt to her left, aren’t you? I won’t judge. 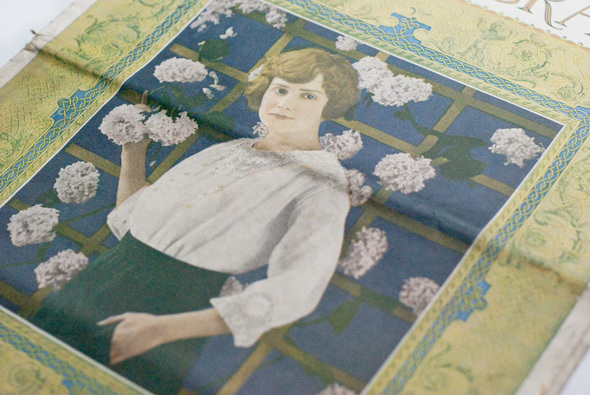 There aren’t many flapper styles in this magazine- the images portray what women wore when they were at home. Momma couldn’t get her iconic fringe dress dirty, now could she? And can you believe this advertisement? Addictive laxatives must have been a real problem! In all of these magazines there are small sections dedicated to items you can buy from them with so many subscriptions, or issue purchases. 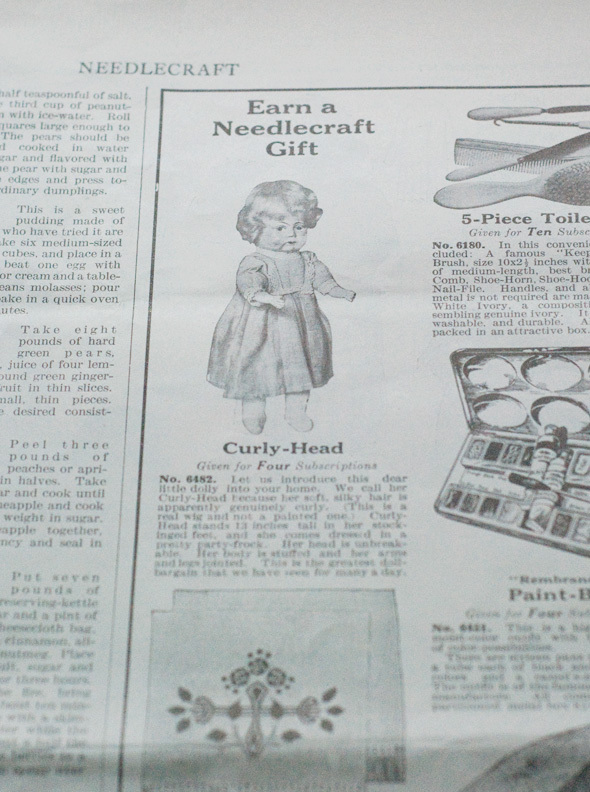 I can tell you what I would never be buying- this terrifying baby doll with human hair. She gives me the creeps from this picture alone. I assure you that her “unbreakable head and jointed limbs” came in handy while she walked around your house in the middle of the night. 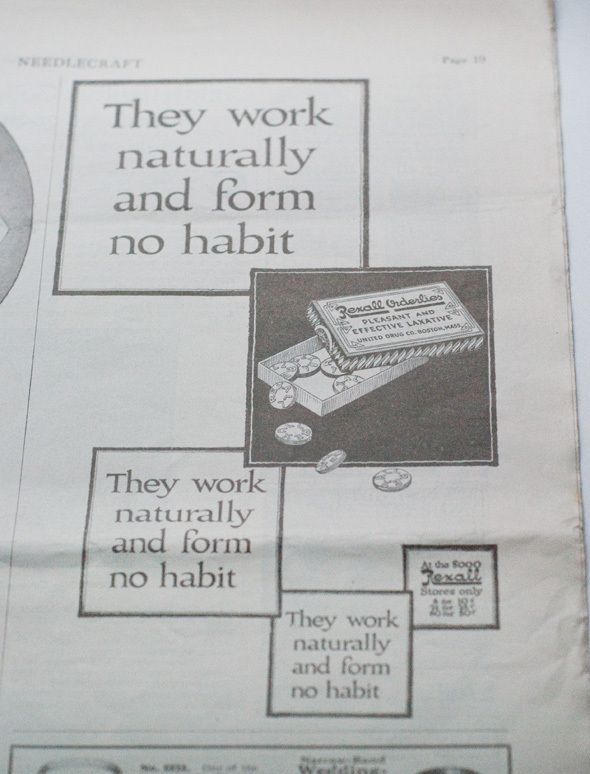 The back page of the magazine shows that they were starting to use more ink in the publication at this time. 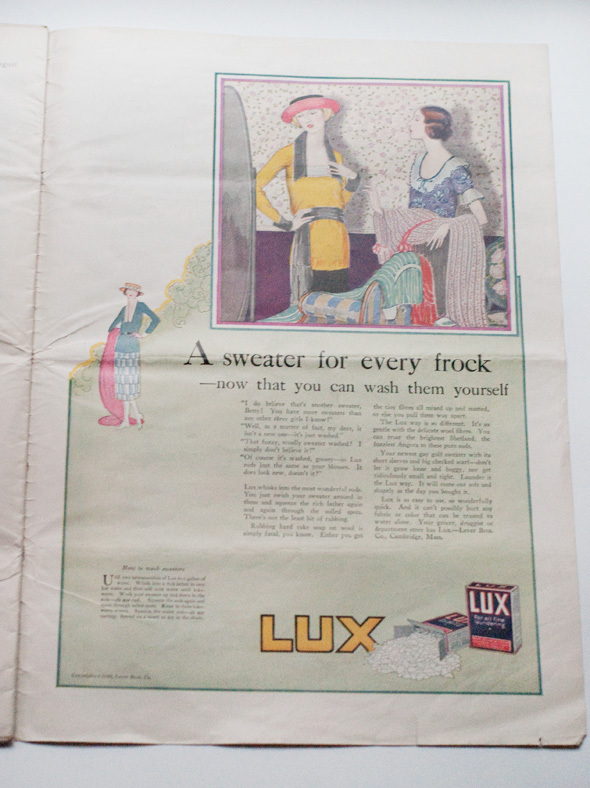 A Lux advertisement has some great copy and color to it. 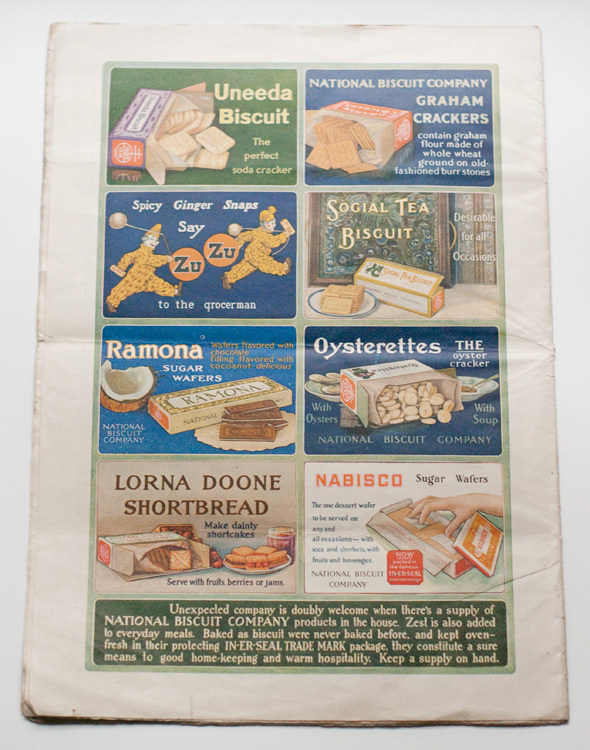 The back cover has eight different products promoted on it, all made by the National Biscuit Company. Lorna Doone cookies really have been around forever! 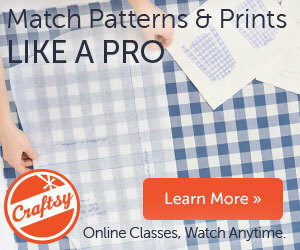 Overall, this magazine has a lot of great information about embroidery methods, patterns and linens, tatting, crocheted collars, gifts, baby sets, recipes and more fashions. I can certainly understand why someone would hold onto it! 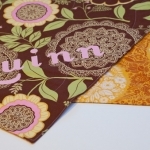 This entry was posted in Embroidery, General, Projects and tagged patterns, vintage on December 1, 2011 by Amy Alan.